I'm very proud to announce that we finally got a new mailbox. 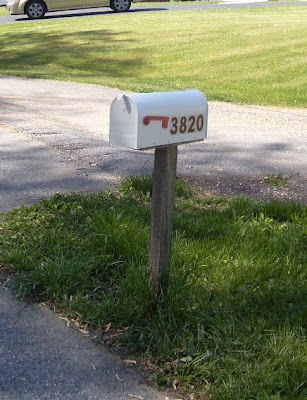 As I mentioned awhile back, our original mailbox had no flag and was generally pretty useless. It was an embarrassment, really -- and for $13 it's even more embarrassing that we waited so long to replace it. So... yeah. It's a little tough to revel in the small victory of a new mailbox when this is its backdrop. Hopefully, things will look a lot different by the time winter rolls around again. FYI the kitchen is that gray section with the stilts supporting it. That's our next big house project. 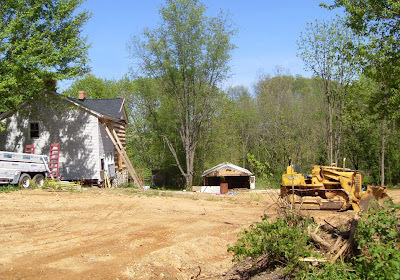 The bulldozer, which we borrowed from a family friend, is there to redirect the driveway. I am excited about this. The old driveway used to cut straight across the front yard, in a deep channel that S's dad has since filled in with his bobcat (hence the lack of grass). The new driveway will start several yards down the road and approach the house from the front instead of the side -- like a driveway should. When that's done, the mailbox will be moved and placed on a new post. We'll plant grass and trees and other plant life. The landscape will call less negative attention to the porchless, half-finished state of the house. Thank God we have patient neighbors! Where's that big 'ol rural mailbox we talked about? You know, the kind you could make a dog house out of if you had to. I'm doing landscaping as well. Yesterday we bought timbers and what-not, to put around the open side of the house. Folks we know called to offer up plants, dirt and large stones. Who could turn down that blessing? I wanted the big ol' mailbox, but decided to wait because the post was built for a small one. Since we're moving the whole shebang altogether sometime in the future and really needed a mailbox now, we bought the same size we had. A compromise, but not a big deal considering some hoodlum will probably smash it with a baseball bat in a few weeks' time.